The sports movie is almost a relic at this point. These days, a sports film is more likely to be something that deals with the business of sports (e.g. Moneyball, Draft Day) than an athlete hoping to reach their dreams. In that way, Stephen Merchant’s Fighting with My Family is almost a charming throwback. Based on a true story, Merchant’s film doesn’t try to upend any tropes of the genre. Instead, it just plays by the rules and has a good time doing it. Merchant peppers the script with crackling dialogue and then give it a big heart by focusing on a family that refuses to give up on each other even when their limits are tested. Like professional wrestling, the match may be fixed, but it’s still a lot of fun. Growing up in Norwich, England, Raya Knight (Florence Pugh) and her brother Zak (Jack Lowden) have been trained to be professional wrestlers since they were kids by their parents Ricky (Nick Frost) and Julia (Lena Headey). When the WWE responds to a tape the siblings sent in, they get a chance to audition and be part of WWE’s training program, NXT. However, at the audition, Raya is accepted and Zak isn’t. They reluctantly decide to go their separate ways with Raya heading to Orlando to train in the NXT program and Zak headed back home to try and figure out what do now that his lifelong dream is dead. From there, the story splits as Raya must consider if being a professional wrestler is really what she wants and Zak has to cope with the jealousy and pain of losing out on his dream. Going just by its structure, you’ve probably already seen Fighting with My Family in one form or another. Merchant sticks to the formula with Raya being an underdog and an outsider in the world of WWE where female wrestlers come from dancing, cheerleading, and modeling backgrounds rather than wrestling like Raya. She has to push herself to succeed, wrestles with self-doubt, rebounds with a montage, and is ready for the championship. While the script is based on true events—it’s the story of WWE Diva “Paige”—Merchant plays by the formulaic beats of a sports movie to keep the plot moving. Where Fighting with My Family shines is how it works within that structure to be funny and heartfelt. Merchant’s insult comedy is on full display as characters trade jabs, and the whole cast acquits themselves well at the humor. If you’re a fan of Merchant’s other work, you’ll likely be taken with what he’s doing here as he piles on the jokes to win over the audience, which gets us on board with the characters and their journey. And to Merchant’s credit, he’s not afraid to ease up on the comedy if it means taking a dramatic beat to let the characters grow and change. And at no point does Merchant poke fun at wrestling or its fans. There may be humor in the situations and the dialogue, but Fighting with My Family takes wrestling as seriously as its characters. Pugh continues to shine as a rising star, showing that she can dish out the quick-witted jokes while still maintaining the dramatic center of the movie. Even if you don’t have any interest in wrestling, you’re invested because Raya and Zak are invested, and the earnestness in Pugh and Lowden’s performances makes for a winning formula. 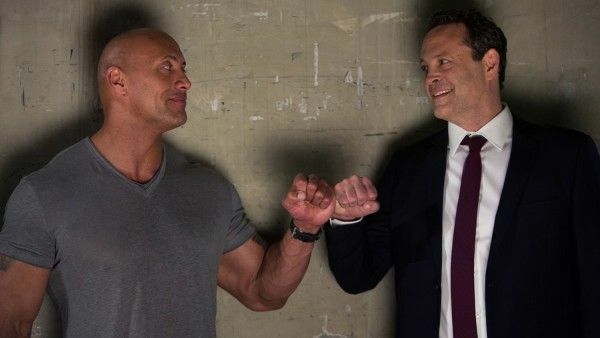 Other actors, like Frost and co-star Vince Vaughn, who plays Raya’s coach, get to fire off a bulk of the one-liners, which allows Raya and Zak to handle the film’s emotional arc, and everyone does a terrific job. I will say that for those looking for a lot of Dwayne Johnson, who plays himself, will have to look elsewhere. He’s only in three scenes, and two of them are in the trailer. There’s nothing unexpected in Fighting with My Family and that’s okay. It’s a sports story about an athlete who fights to achieve her dream. It’s worked before, it works here, and it will work again. Even the presence of WWE helps add authenticity rather than stealing focus and becoming an infomercial for the organization. I’ve never been into wrestling, but it doesn’t matter when you care about the characters and their fight to succeed. Throw in some good jokes and you have a winning combination. Fighting with My Family opens in theaters on February 14th.